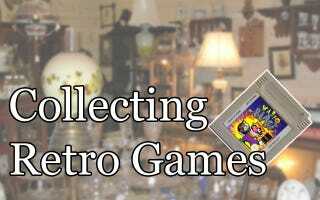 Welcome to Collecting Retro Games, a series of articles detailing the ins and out of collecting vintage and retro video games. Whether you are a beginner just starting out, an experienced collector looking for new tips or are simply a curious outsider wanting to learn more about the hobby, these articles intend to give information on a variety of subjects related to collecting. So far all my articles have assumed you are a beginning collector. That you wanted a vintage game collection and simply didn’t know how to get started without getting frustrated, or feeling like you’re spending and arm and a leg. During these beginning articles I covered how to value a game, where the best places to start building your collection are, how to avoid some beginning mistakes and expanding a collection to merchandise. But if you already have an ongoing collection, there are actually quite a few things you can still afford to learn in regards to being a collector, especially if you are interested in going beyond basic collecting. There is a whole world of restoration, storage, importing and so on. So now we start the next stage in collectibles information with the 200 series. Now, formerly beginning collector, you’ve been scouring garage sales and Amazon, and collecting games like a champ. You have the games, you have the systems, you have that special edition wall scroll that was only available at Localcon, USA. But now that you have all that stuff, where do you actually put it? Believe it or not, putting out games on display isn’t actually as simple as it seems, and here’s why: one of the big battles of any kind of collection, whether it’s the Dead Sea Scrolls to Art Noveau furniture, is the eternal battle against time. Almost no media is designed to be archival, and keeping video games playable and in good condition is something to be done carefully. The good news is it’s not actually all that difficult, and just like books can last hundreds of years, video games can at least last your lifetime, if not longer. And if done in the right way, you can have a handsome, decorative collection that can last for years and years, if you just do a little basic planning. First, figure out what wall, or if you are lucky, what room you want to use to put out your collection. This is probably the most important first step, especially if you want your games to last as long as humanly possible. The key guide is to avoid video games’ worst enemies: temperature changes, UV light and dust. First of all, make sure your collection isn’t directly in front of a window. UV light from the sun bleaches ink from covers, boxes and posters, causes weird chemical reactions to the plastic in cartridges and systems, and causes things to heat up. The other place to avoid is directly under or over an HVAC duct which can shoot up dust or cause dramatic changes in temperature. Temperature changes can cause chemical reactions in plastic as well as warping, so you don’t want to store your games long-term in places that change temperature a lot like garages, sheds or attics. Even good ol’ Nintendonium will start to run into issues from environmental stress. Once you know where the ideal place is to store your games, plan out how you will display it. It’s smart to invest a little money in uniform shelves so that way you can store a set number of cases/cartridges on a shelf. It will also look a lot nicer. Shelves will probably be the biggest investment you make, but if you’re willing to plunk down thousands of dollars on the games, it only makes sense to invest a few hundred on shelves and display cabinets that will allow you to keep those games away from dust and off the floor. The good news is big box stores regularly have sales on shelving, and you can get old display cases from stores going out of business for relatively cheap. It’s also smarter to put posters in frames with UV blocking plastics and glass so that way they don’t get destroyed either. Metal filing cabinets are also great for storing controllers and cords out of the way neatly, and away from dust and light. Once you have your storage set up in a good place, there are a few additional extra steps you can take to keep your games in optimal condition. First off, never crowd your shelves. If you have to cram a game or box onto the shelf, you are risking cracking the case or the cartridge, and will probably ruin a paper box. A good rule of thumb is that you should be able to pull one case off the shelf without pulling any others with it. If you grab one and the neighbors are getting yanked along with it, your shelving is too tight. Secondly, make sure you always store your discs in their original snap cases, or get replacements if you don’t have the original ones. Those folder cases for CDs are actually your worst enemies. Not only do they make tiny surface scratches every time you pull the disc in or out, many of those folders are made of PVC, and every so often they have bad chemical reactions with other plastics, and can literally fuse to the disc, either damaging the game or ruining the label. Make sure that you space out your consoles so they have plenty of air and can’t overheat, and unplug systems you haven’t used for more than a month. Don’t store games right near the television either so you don’t get build up of heat or static. If there is anything I keep repeating it’s that HEAT IS BAD. A lot of stores sell storage boxes and bins just for games and controllers. As long as they aren’t made of PVC they should be fine. Polypropylene cases are fairly non-reactive and the soft polyester fleece prevents scratches on controllers. As long as you keep your stuff away from the sun and vents you don’t have to worry too much about heat or light, but dust is an ongoing problem, especially with games. Electronic equipment produces a lot of static electricity which attracts dust in droves. While it is tempting to use an anti-static or anti-dust sprays, don’t use them. They leave behind a residue that builds up. At best it’s simply sticky and leaves a tacky sensation over your stuff that will eventually attract more dirt, at worst it can discolor your stuff. A better way to deal with dust is to use a dry, used dryer sheet. A used one means most of the chemical is gone and they don’t leave a residue unless wet. This will help keep static off of the worst offenders. But just get ready to vacuum and dust regularly wherever your collection is being stored. For DVD-based consoles like the PS2 and Xbox, use a device called a DVD player cleaner. It’s a special disk with a little brush on the face that helps particles from building up in the machine. Just make sure that it’s compatible with the system, and it will say so on the package. If you go more than a week without playing a game, remember to take it out of the system so the residual heat won’t damage the disc, and always keep your systems attached to a surge protector and turn it off during thunderstorms. While what I’ve talked about so far has to do with protecting your collection from time and environmental conditions, there is something else you need to protect your collection from: theft. Your collection is worth money, and video games are often the first thing targeted by a burglar. Aside from regular precautions like locks, security systems and German Shepherds, it is extremely important to keep your collection documented, and added to your homeowner/renters insurance. Photograph every item you have, and keep an excel spreadsheet that documents where you bought it, how much you paid for it, and the condition in which you bought it. Write down every serial number on every system you have and keep everything together on a flashdrive kept in a safe or some other safe place. It is very common for thieves to use pawn shops and Gamestop to fence their goods, and the police will probably not investigate too much unless there is a rash of burglaries in the area, because game theft isn’t taken very seriously. By having documentation of your collection and proof of what you had and what it’s worth, you can get your stuff back or at the very least replaced by filing an insurance claim. If your local Gamestop has one of your stolen systems and refuses to give it back, contact the police right away because knowingly selling stolen goods is a serious crime. Having a collection is only the first part of collecting, maintaining your collection is the second, more crucial part. There isn’t much worse than finding something you really wanted only to lose it due to negligent care or bad decision making. Keep the environment where you are storing and displaying your collection cool, clean and out of the sun, and clean regularly without chemicals. Watch carefully the materials you use to store your goods, and keep everything documented in case of some unexpected disaster. A good setup early on makes things much easier later on, and a seemingly large investment in time and money will pay off in dividends. Take care of your collection and it will take care of you for years to come.